When Oli spent time travelling the world as chef on some huge oil tankers, you can bet the crews ate well. Travelling all around Europe, into the Mediterranean, the Black Sea, to Norway, Russia, the Baltic, even the USA was exciting. For Oli it meant just a few weeks at a time away from home. For the crews, it usually meant months, even years away from home. And for the crews, home usually meant the Philippines. One evening, some crew members asked Oli if they could have after-hours access to the galley (you know, for midnight snacks and such). They weren’t asking for much, mostly some garlic and soy sauce. It was fine with the chef, as long as they left the galley they way they found it. Oli had one other stipulation – perhaps they could leave him a small portion of whatever snack they prepared. Well, they add that garlic and soy sauce to chicken parts, then braised them until the meat was falling off the bone tender. Hmmmm, the crew then disappeared. They were no longer in the middle of the Black Sea. They were back in the Philippines. Even the best of sailors get homesick and these guys were longing for a taste of home – adobo. Adobo is not just any aromatic stew. 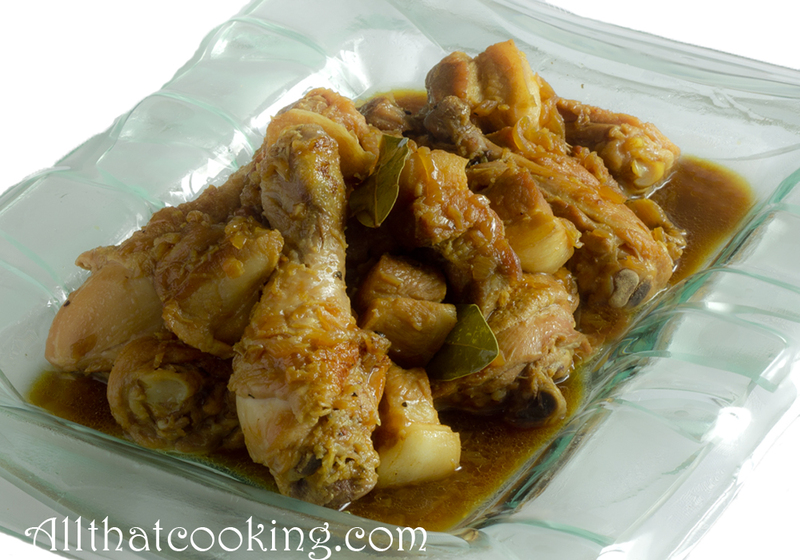 Adobo is a way of marinating and stewing meats (or fish) in a simple brine of vinegar, soy sauce and spices. As well, before the advent of refrigeration, it was a way of preserving food. Back in the Black Sea, the crew shared their midnight snack and recipe for adobo with Oli and all was right with the world. Throughout Oli’s time spent on tankers, crews from the Philippines always longed for adobo. To their delight, Oli added adobo to his menu. When he really wanted to make their day he served crème caramel for dessert. Why crème caramel? It’s the favorite dessert in the Philippines (recipe). I think I can persuade Oli to share that recipe too. Stay tuned. 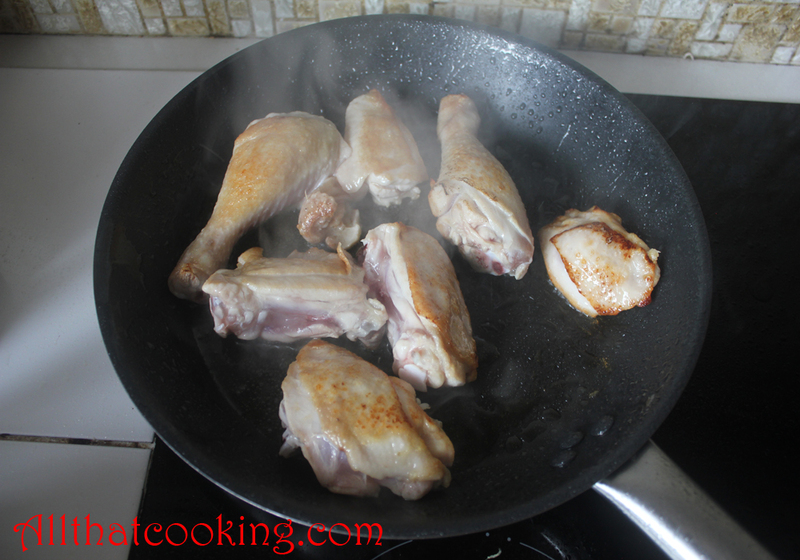 If you add the vinegar at the beginning of the cooking process, it dries out the meat. Adding it towards the end, makes the meat tender and succulent. 1. Heat 2 tablespoons of the oil in a large skillet over high heat. Add chicken and cook until just golden. 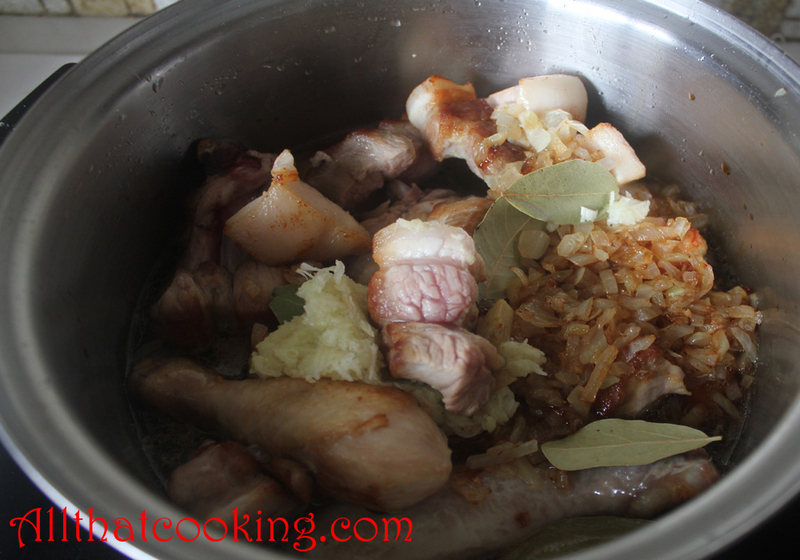 Transfer to a pot that is deep enough to hold chicken and ribs. Keep nearby. 2. 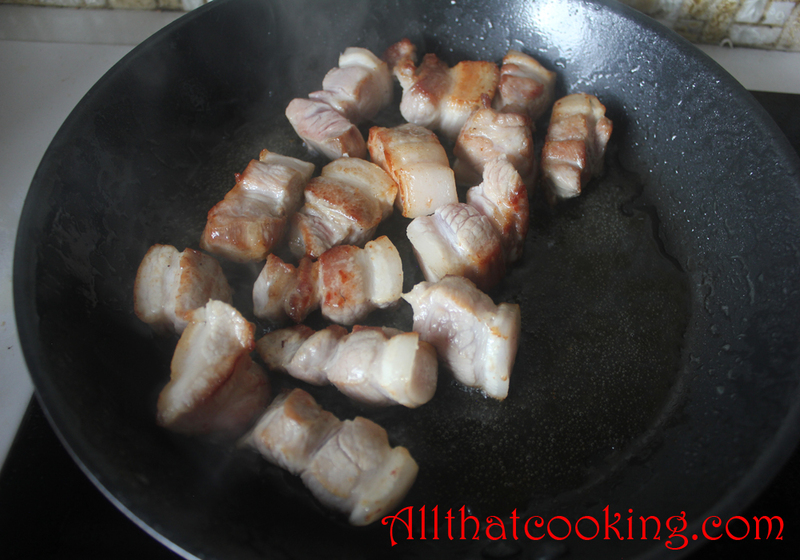 Add ribs to same skillet and cook until golden. Transfer to pot holding the chicken. 3. Add remaining oil to skillet, reduce heat to medium high. 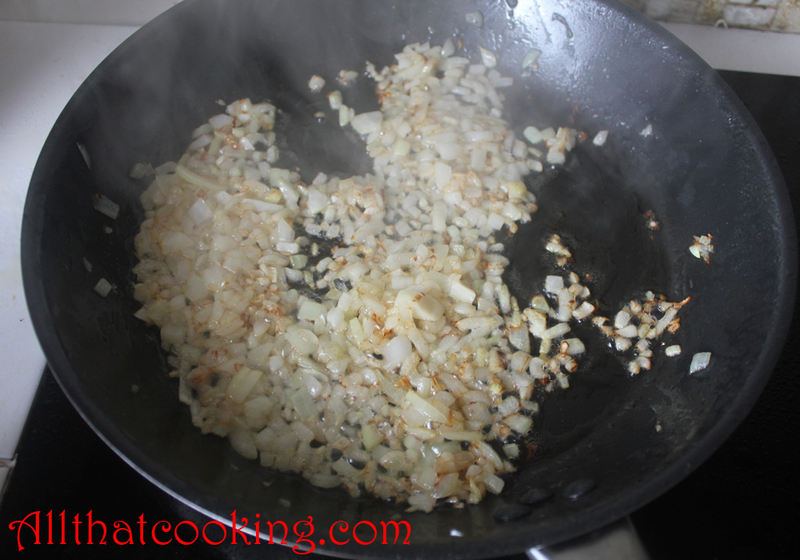 Toss in onions and cook until lightly colored and translucent. 4. Throw onions in with the chicken and ribs. Toss in garlic, peppercorns and bay leaves. Pour in water and soy sauce. Give it a stir to distribute all of the ingredients. 5. Bring to boil over medium high heat then reduce heat to low, cover and simmer for 15 minutes or until rib meat is tender. 6. Stir in vinegar and brown sugar. Simmer for about 5 more minutes. Jasmine rice is the perfect accompaniment. Gallery | This entry was posted in Main Dishes and tagged chicken and pork adobo, Philippine adobo, Philippine adobo stew, vinegar braised chicken and pork. Bookmark the permalink. I am a Filipina and my cousins work as crew in the sea too. Thank you for bringing Filipino food to the crews. I bet preparing food so familiar alleviates the sadness of being away from home. I love adobo. In fact we made some yesterday and still have a lot of left overs to munch for tonight. Nice picture and I hope your readers will try this oh so delicious Filipino dish. Such a lovely comment! Thank you. When far away from home, it really is the food of one’s homeland that quells that hunger and longing. . .
Ég ætla að prófa að gera svona sjálf við fysta tækifæri, þetta er rosalega góður réttur. Hæ, endilega prófa. Þetta er líka einfalt, hollt, lágt í kaloríum. Þú getur sleppt sykrinum ef þú villt. Einnig geturðu t.d gert réttinn bara með kjúklingalærum. Þarft ekki að hafa 2 tegundir af kjöti. Gangi þér vel og láttu vita hvernig gekk.